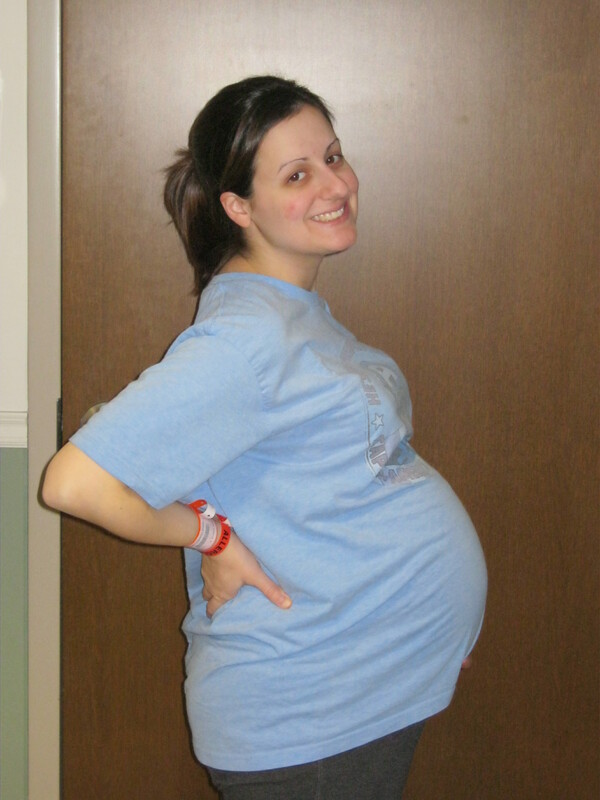 A Beautiful Ruckus: 26 Weeks!! Praise God! Yesterday was 26 weeks! We feel like we have jumped another hurdle. Our babies now have an 80% chance of survival as opposed to the 50% they had when we walked into the hospital just over two weeks ago. Now we are praying for 27 weeks. At my sonogram on Wednesday, the ultrasonographer was able to catch a really fun picture of our quads. She has been doing sonograms for more than 30 years and has looked at several sets of quads, but this photo was a first for her. She was so excited, she actually took the photo, left me in the room for a few minutes, and went around to show it to the other ultrasonographers she works with. She was able to get all four heads in one photo! That is incredibly hard to do, especially at this gestational age with all of them smashed up together. It’s obviously not 100% accurate as the babies are much bigger inside their sacs and they really are squished together. It’s also only a 2 dimensional drawing. Elijah is actually tucked behind Caleb and Abby, so you shouldn’t be able to see his head in my picture. However, I wanted everyone to see his smiling face so I took creative license while drawing it! You keep talking about Caleb, Abby, Elijah, and Ellie, but are you really talking about the same baby each time? Each baby is in his or her own sac and they each have their own placenta. Each one of them is attached to part of my uterus just as they have been since they showed up in there. Because they are anchored to different parts of my uterus, the sacs don’t change location even though the babies can roll around within their sacs. The sonograms we’ve had over the past few months have shown us where the babies are inside of me. So when Sean and I talk about a specific baby, we are talking about the same baby each time. Can you tell which baby is which when they move around? Yes! I can tell which baby is kicking me based on where I’m feeling the kicks since the location of the sacs never change. How are they going to know which one is which when they start delivering them? 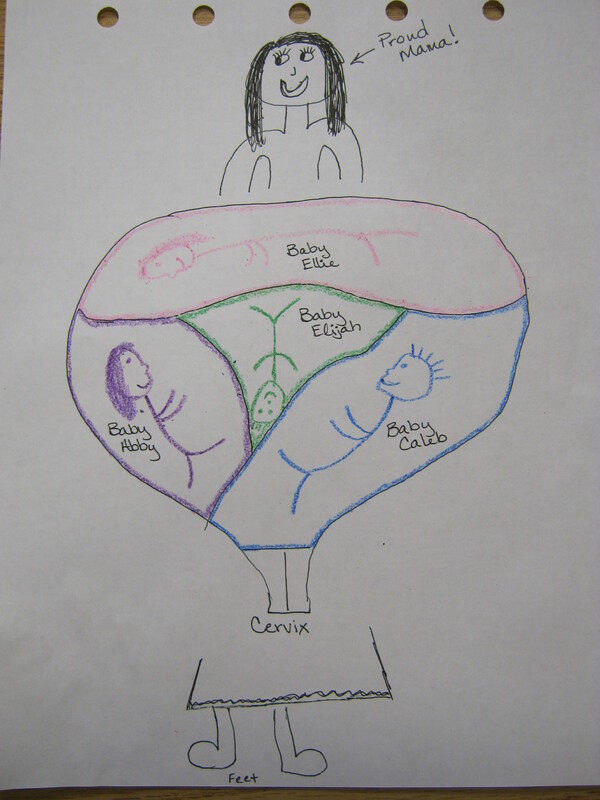 The doctors know our babies as A, B, C, and D, so when they are delivered, they will be able to keep track of which baby is which based on their location before they pull them out (see the above drawing). The horizontal cesarean section incision will be made so low that Caleb will most likely make his appearance first followed by the others. Nope! They came from four separate eggs and are in four separate sacs. There are no twins or triplets in there. They won’t look alike (other than the resemblance that siblings normally have to each other!). Are you ready for this? I can’t imagine having quadruplets! I've found that a lot of people have the same questions, so if you have a specific question that I didn't answer above, you can leave it in the comments. I’ll try to answer some of them in upcoming blog posts (emphasis on “try!”). Everything about this post is awesome! Thanks for sharing - we love you guys! Hey Rebecca and Sean... I absolutely LOVE your blog updates; this one was so fun and encouraging. Praise the Lord for how He has been caring for you and each baby! I want you to know that we are praying for you and so is my Beth Moore Bible Study in Puebla, Mexico. They were asking for updates last night, so I will pass this on to them. Keep taking good care of those babie! Love to you all! I have been following you guys and the babies through mutual friend. You guys are definitly an inspiration to all around you. Thank you for sharing your experience and I pray that your 4 bundles of joy stay in the womb as long as possible. What a wonderful post! Now I will be able to envision the exact position as I pray for each one. 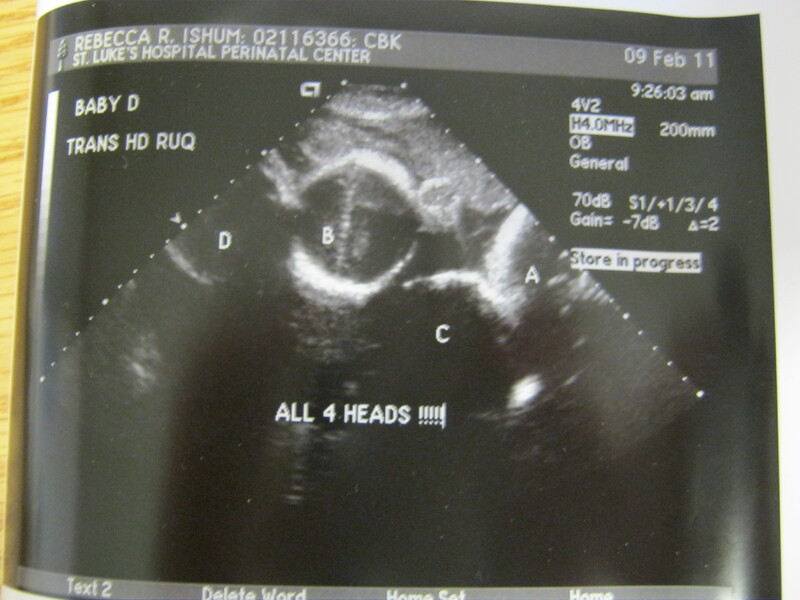 I copied the "All Four Heads" sonogram and your beautiful drawing to "My Pictures". I will be looking at them while I'm praying. PS: You mentioned milk costing $4.00/gal. I highly recommend putting a COSTCO membership on your "wants and needs" list. You should get the "Executive" membership that costs $100.00 --It gives rebates annually based on what you spent over the past 12 months in the form of a rebate check. Mine usually pays for itself and that's for only TWO people! They have high quality food and lots of "organic" choices if you are trying to focus on that. Common to everywhere though, organic costs double what non-organic costs. I find that the "Kirkland" house-brand is superior to any name-brand I used to insist on buying. I haven't even met you guys, but I think I love you! --as though you are one of my own kids going through this. I am so in love with these babies! I thank God daily that they are thriving inside you and grow stronger every day! All my love!... Baby Emilia says hi! Whohoo!! 26 weeks! Praise God, He is SO good! :) We are praying hard for 27, 28, 29, and 30 weeks. See? All that practice coloring when you were a little girl paid off! You are so beautiful and so are your babies! Congratulations on making this milestone, now on for the next one! Everyone is praying for you and your family. God is good! Yay! Praying for you and the babies! Glad to hear some good news! Nice picture Becc. love you. Thanks for the Educational update! Three babies of my own and never quite knew this about multiples... my bro & sis were twins (fraternal). We continue in prayer for the 6 of you! Thank you so much for all the great info you have given us these past few weeks. I look forward to each blog that I get and can't wait for the next one. Am so excited that you have reached 26 weeks ~ PTL!! I count it a privilege to be praying for you and your babies. I'm on Team Eli and am praying for him, but am also praying for all the babies as well as both of you. Thank you for allowing us to be a part of your journey. It was so interesting to read about what will happen when it's time for the babies to be delivered as well as who will be in the OR and what they will be doing. What a team! Also your picture of the babies in this blog was great!! Answering the questions was so informative as well. Your doing a great job keeping us up to date. Keep up the good work. I love the picture of you each time too. I was actually at St. Lukes today and thought about coming to see you. I was seeing pts so didn't have time. Glad to hear everything is going well. You look absolutely amazing Rebecca. Keep up the good job of holding babies in. Continue to get lots of rest you need it. Sean you should also start resting, Rebecca is going to need you more than ever when babies are here. I love the blogs and all my friends and family ask about you guys frequently. Prayers are still here and coming. YES!!! God is good...always! Week 27...here we come! You look adorable as always, but lets just say, "I can sure understand why you've been having back issues!" love you! So happy that you've reached 26 weeks! Thank you for the wonderful updates and for sharing this experience with us. :-) God bless all of you! Congratulations for making it 26 weeks now... hang in there for a few more weeks. It'll all be well worth it, especially when you have 4 healthy babies. Hope you get a chance get some fresh air next week when we'll have some warm weather. Thank you so much fir the update. It was very informative. You and your family are in our prayers. I am still praying those four stay put until at least 30 weeks. Wow you guys are doing so well keeping us all updated! I hope we dont pressure you too much for info! :-) Excellent drawing by the way... I'm impressed... must have been the homeschooling... we tend to rock in art class ;-) Yay for making in 26 weeks! 1 day at a time! Praying for all 6 of you! That's so awesome! Keeping my fingers crossed you can make it to 28 weeks or even 30 weeks! You look so cute and happy in your picture today! You probably feel huge, but you really aren't! Just right! What a wonderful, upbeat post! Continued prayers from Arizona and contined wishes for a healthy set of quads! Love your blog and all the explaination Becca. Praying for you daily! Glad to hear that currently, all is well! Just found your blog via another quad mom- Congratulations! My quads just turned two and were born at 32 weeks. Let me (or any other quad mom) know if you need anything! I have 2 older kids also that I homeschool! 2 of my quads are Ellie and Elijah "Eli" so I LOVE your names....LOL! Congratulations on 27 weeks, that is awesome! You seem to be doing very well, so keep up the good work. My gbbg quads are 18 months and I also 3 other children. If you need anything please don't hesitate to ask, from questions about surviving the pregnancy and the roller coaster ride of NICU to what to expect when they all get home. There is a whole lot of us out there, you certainly aren't alone. So please feel free to contact any of us. The right side bar of my blog has an extensive list of quad mom blogs. We are also on facebook. Just wanted to be among the quad moms to welcome you to our wonderful world! It is truly an amazing life! My quads are 2 and were born at 33w4d.